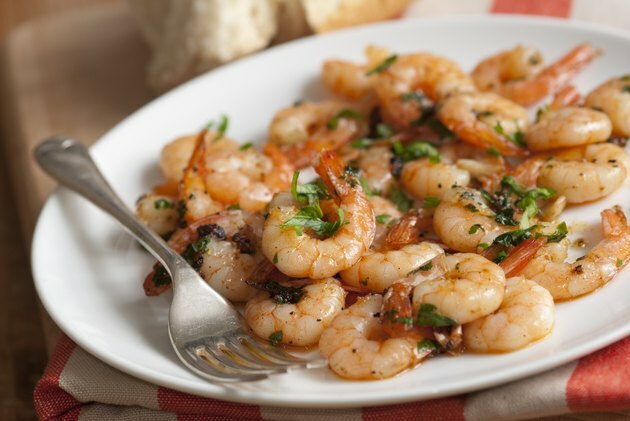 Few varieties of seafood can rival shrimp as an ingredient in fast, convenient meals. High in protein and low in fat, shrimp lend themselves to almost any healthful preparation method, from steaming to grilling. Like other varieties of shellfish they're extremely perishable, but if you keep high quality frozen shrimp on hand you can enjoy their sweet flavor any time the impulse strikes. They're usually thawed before cooking, but preparing shrimp straight from the freezer is often more convenient. 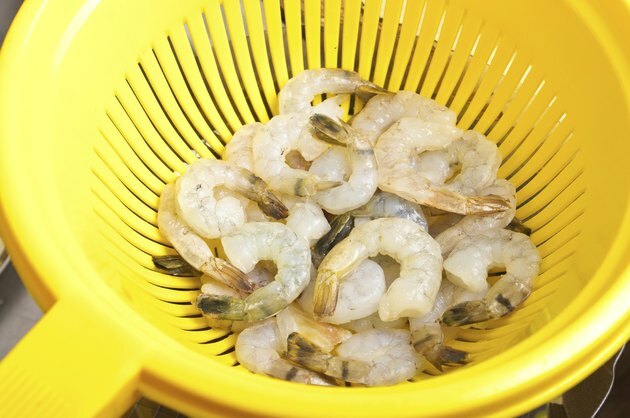 Most shrimp are individually quick frozen, or IQF, which means you can count out as many as you need for your meal and return the rest to your freezer. Many are sheathed in a thin glaze of ice to protect against freezer burn, so they'll need a quick rinse under cold running water before you use them. Deveined or "zipperback" shrimp, with the shell on but the vein already removed, are a convenient option for cooking from frozen. Deveining frozen shrimp is challenging, so whole shellfish with the vein left in are best thawed before use. Grilling shrimp requires close attention, because the intense heat can easily overcook their delicate flesh. 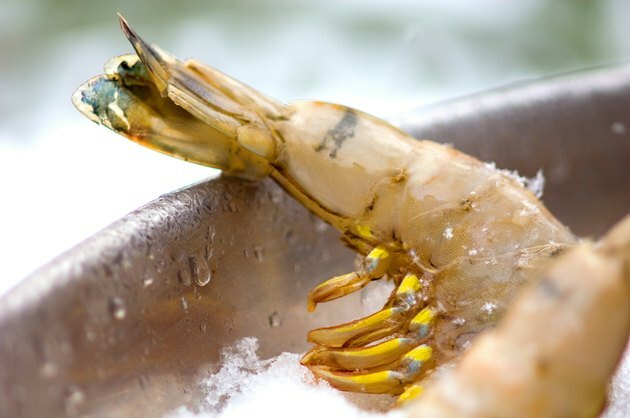 Cooking them from frozen provides a degree of protection against that risk, so the end result can be better than with thawed shrimp. 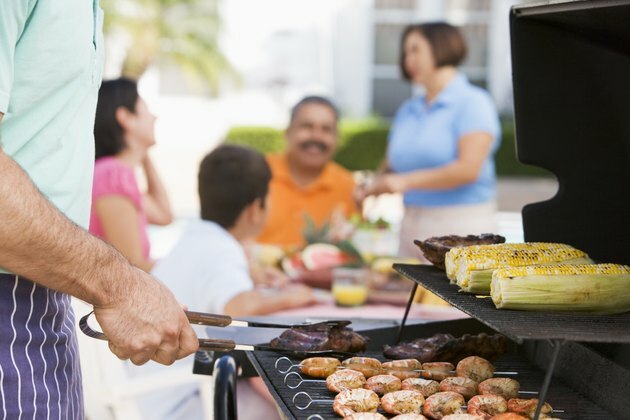 The shells provide additional protection against the grill's heat, and impart a pleasant flavor as they char. Brush the shrimp with lemon or lime juice as they grill and sprinkle them sparingly with sea salt, for a light and clean flavor that goes well with rice or stir-fries. They're done when the flesh at the thickest part is on the verge of turning from opaque to white. Steaming the frozen shrimp cooks them quickly, taking just a few minutes for most sizes. Steaming them over wine, or on a bed of fresh herbs, infuses them with mild complementary flavors. For a bolder flavor infusion, poach your frozen shrimp in a court-bouillon. Court-bouillon is water that's been boiled with wine vinegar, lemon slices, onions, peppercorns, salt and fresh herbs to give it a strong flavor. When strained and cooled, it's the classic liquid for poaching seafood. Shrimp poached in court-bouillon are excellent when served cold, as appetizers or as garnish on a salad. Shrimp can be added to many meals at the last minute, cooking quickly in a broth or sauce. They'll exude some moisture as they thaw, but this will add flavor to the surrounding meal. 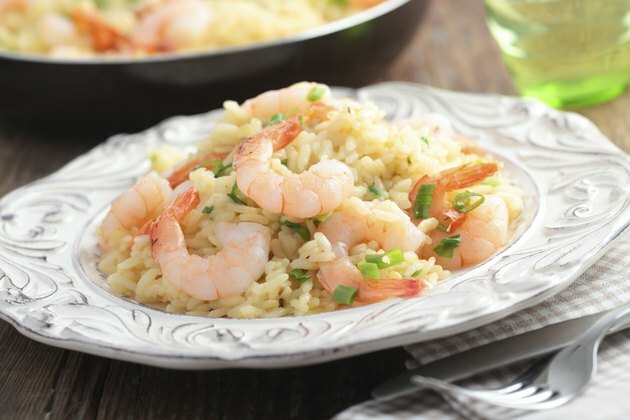 Stir small to medium-sized shrimp into a risotto during the last 6 to 8 minutes of cooking time, or scatter them over the top of a pilaf once most of the water has been absorbed. Shrimp are also at home in most pasta sauces, or seafood soups. Peeled shrimp are usually the best option for adding directly to dishes, though shell-on shrimp are appropriate for dishes such as cioppino that require a degree of eating with your fingers.